Can one really get a free meal these days (in a restaurant that is)? Sure, Denny's offers up one on your birthday, but then again, you have to bring a paying customer with you. Oh yeah, Red Robin gives you a free burger on your birthday, so I guess that is one option. 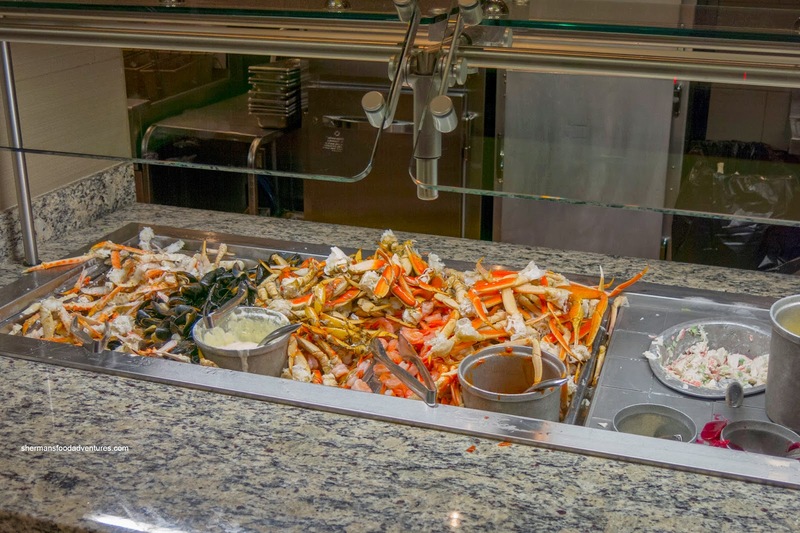 However, how about a seafood buffet (normally $27.95) for no charge? 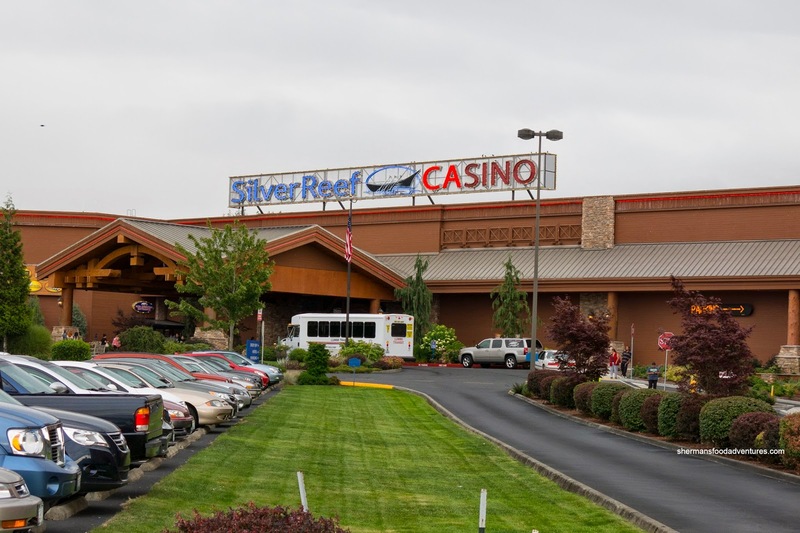 Yes, the good folks at the Silver Reef Casino will comp you one buffet a year if you join their Diamond Dividends. Viv and I did just that on our last visit to Semiahmoo as well as losing money at slots (oh, that's how they get us...). We returned with the kiddies (yes, to the casino) a few weeks later to claim our free seafood buffet (on Thursdays and Fridays). 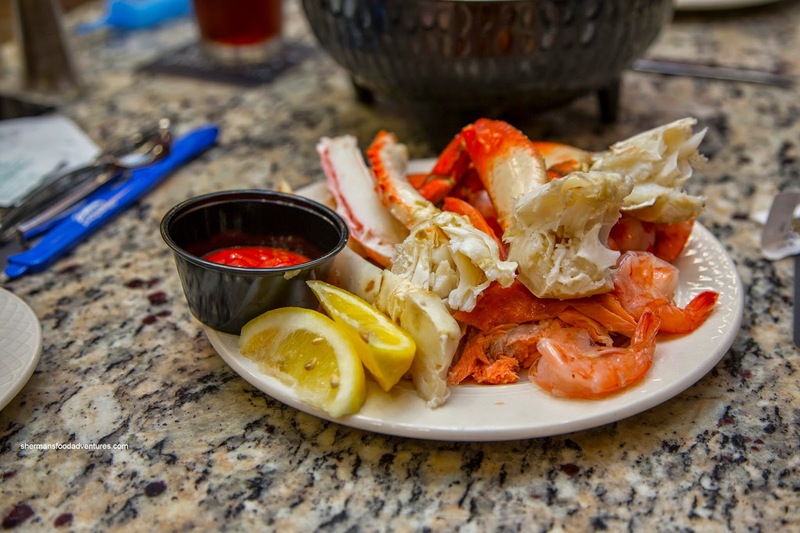 Although not a big buffet in terms of variety and space, the stars of the show were all present in the cold section - Smoked Salmon, Snow Crab, Cocktail Shrimp, Dungeness Crab, Mussels and King Crab. Well, there was a small salad selection in the space before, but I didn't waste my time eating greens... So for my first plate, I loaded up with everything but the snow crab and mussels. And you know what? The stuff was pretty good! Starting with the smoked salmon, it was buttery soft, plenty seasoned and mildly smoky. I moved onto the shrimp and it had a buttery cold water snap. As usual, the king crab was a bit spongy and salty, but okay nonetheless. My favorite was the dungeness crab as the legs were large and meaty. The texture of the meat was on point being fluffy and firm with a natural sweetness. With 2 soups available, I let my daughter have a go with the Clam Chowder while I went for the Crab and Corn Bisque. One of the reasons I stayed away from the chowder was it could've passed for wallpaper paste. It was so thick, it stuck to the spoon and wouldn't let go. Flavorwise, it was creamy with the brininess of clams with big chunks of tender potatoes. 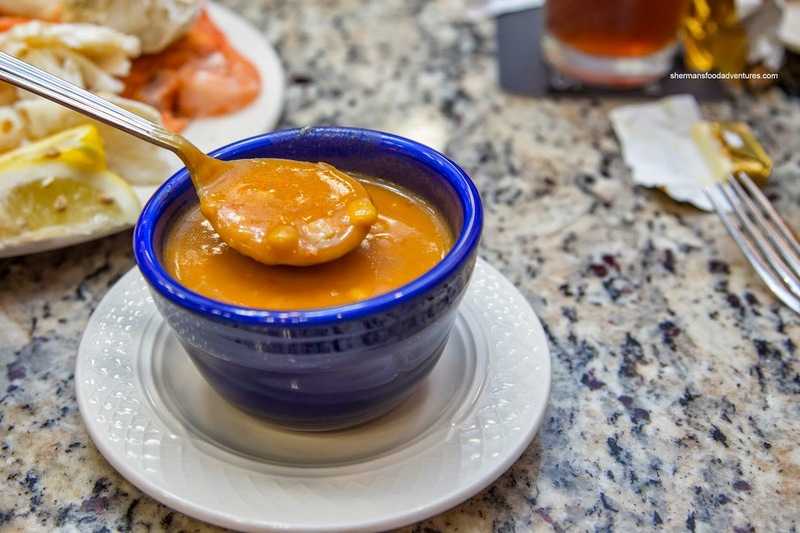 Although salty, the bisque did have the essence of crab and the sweet pop of corn. It was mildly creamy as it was more of a soup than a bisque. 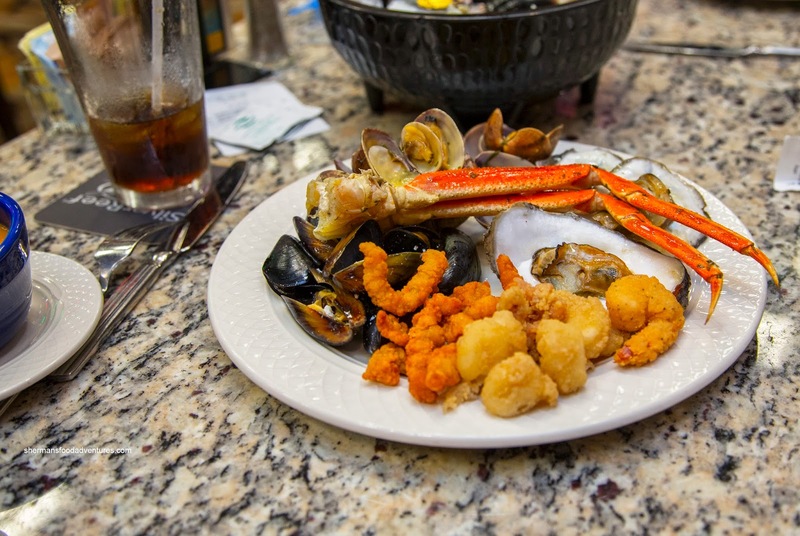 For my second plate, I had the other available hot seafood including Fried Clams, Calamari, Fried Shrimp, Mussels, Clams, Oysters and Garlic Butter Snow Crab. The fried items were not bad being crunchy while still moist inside, but the oysters were woefully overdone. Nothing wrong with the clams and mussels while the snow crab miraculously maintained its fluffy texture despite sitting in a chaffing tray. 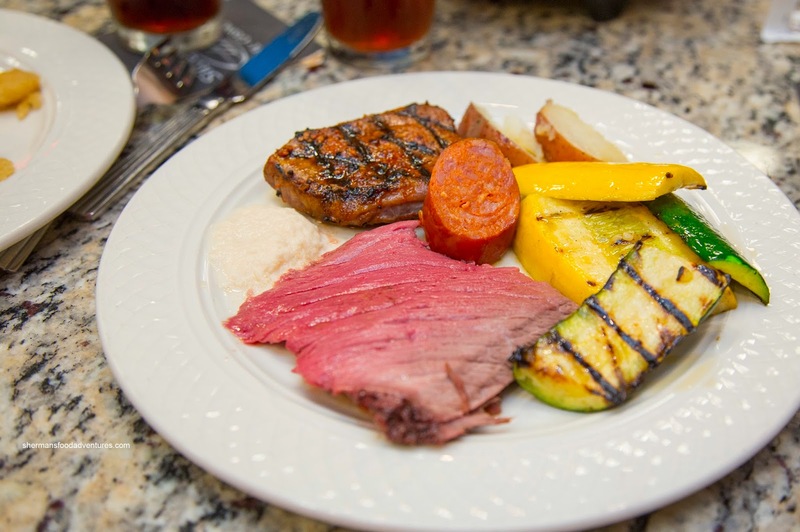 Moving away from the seafood, I tried some of the meat items including Baron of Beef, Sirloin Steak and Andouille Sausage with some squash and potatoes. I asked for the rarest part of the baron of beef and it was indeed so. Due to the cut of beef, it was also not super tender either, but it was still chewable. On the other hand, the steak was fairly tender albeit completely done. It did sport a nice smoky char and it was well-seasoned. With a snap casing, the sausage was juicy and springy with a touch of spice. The veggies were okay where they were not overcooked. 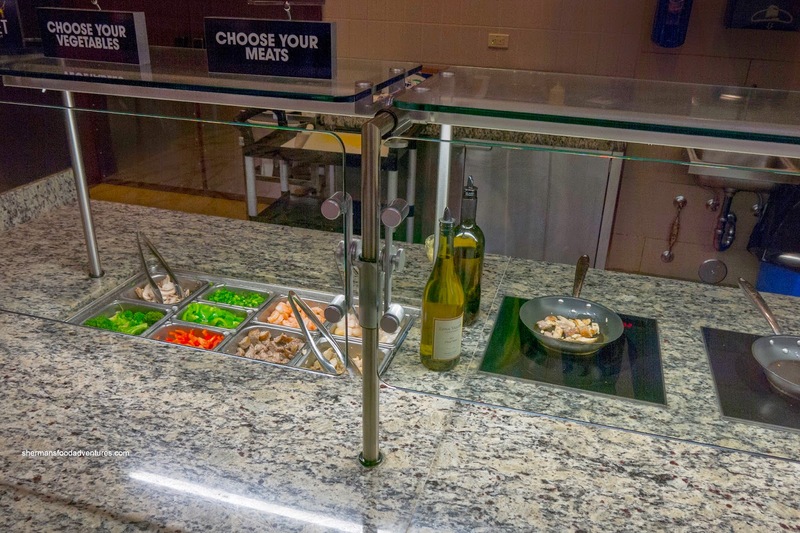 Next door, there was a Build-Your-Own-Pasta with a selection of ingredients including mushrooms, broccoli, peppers, green onions, sausage, shrimp, baby scallops and grilled chicken. My son ended up with a Fettuccine Alfredo with chicken and sausage. The pasta wasn't exactly al dente, but it wasn't too soft either. The sauce was creamy and well-seasoned, but the chicken was horribly dry. - You can get it for free once a year! Next year (meaning January), use the coupon in The Steak House, or even the Cantina. 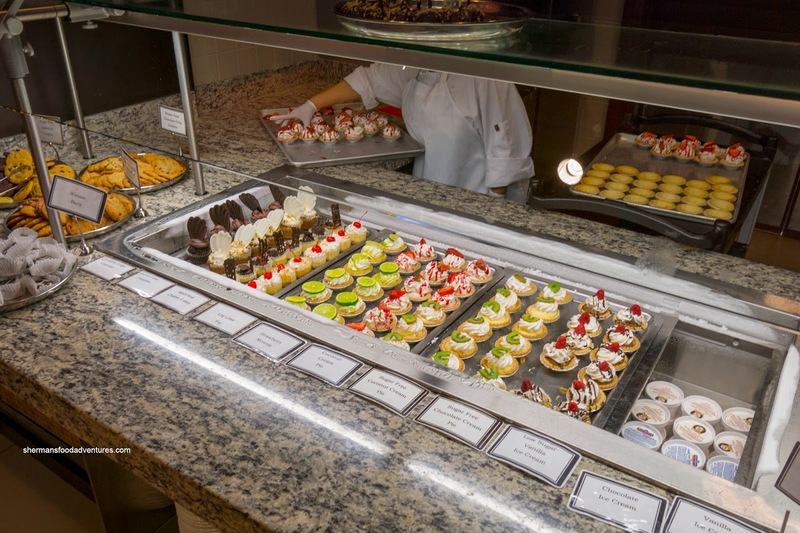 The value of the coupon is based on whatever the buffet is that day, so go in a day when they are running the seafood buffet, as that is the most expensive, and thus the best value. The buffet is not great, but The Steak House is great. @Doug Thanks for the tip! Sounds like a good idea!